May 7, 2018, 10:20 AM · In an effort to promote the coverage of live violin performance, Violinist.com each week presents links to reviews of notable concerts and recitals around the world. Robyn Bollinger performed her multimedia recital "Bass of Time" at Boston's Gardner Museum. Boston Globe: "...she did more than just perform dauntingly difficult works by Biber, Bach, Bartok, and Berio. She melded them into an evening-length exploration of the ciaccona as such — a Baroque dance form that has morphed over the course of centuries.... Throughout the night, Bollinger’s technique proved equal to every challenge, with playing that was poised, precise, and musical. It was in the Berio, however, that her performance seemed to catch fire, projecting both a sense of visceral commitment and a physical athleticism placed at the service of bold musical expression." The Boston Musical Intelligencer: "(Bollinger) honors her audience by invoking an exploratory mood that invites each listener to create relationships to the music through personal recollections. Bollinger’s unique approach as intellectual facilitator and translator endeared her to the audience, many of whom stayed for a post-concert Q and A session. The world will be hearing more from this engaging and original talent." Robyn Bollinger. Photo by Kristin Hoebermann. 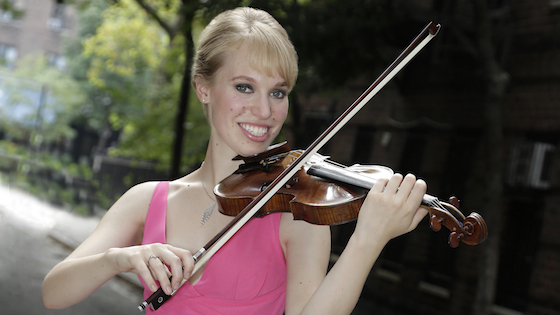 Simone Lamsma performed the Bernstein Serenade with the San Diego Symphony. San Diego Union-Tribune: "Lamsma’s sound was exquisite, a penetrating tone that commanded attention from her first bow. She was sweetly lyrical in the slow movements; in the fourth movement, there is an ethereal melody high on the fingerboard that she made sing. Her double stops were beautiful. Her final note at the end of the fourth movement was gorgeously sustained." Nicola Benedetti performed the Bernstein Serenade with the Baltimore Symphony Orchestra. Baltimore Sun: "...violinist Nicola Benedetti, in her BSO debut, delivered the solo part with a sweet, but penetrating, tone and a keen sense of the music’s rich character." Ning Feng performed the Mendelssohn Violin Concerto with the New Jersey Symphony Orchestra. NJ.com: "Feng is a 36-year old virtuoso who instantly perked one's attention in the first notes of Mendelssohn's Violin Concerto in E Minor thanks to his light touch and sweet tone. His podium presence is understated: thoughtful, expressive but not flamboyant bowing--he let's the music speak for itself." Joshua Bell performed the Bruch Concerto with the Quad City Symphony Orchestra. Rock Island Dispatch-Argus: "...Mr. Bell made us all feel young at heart, bursting with possibilities and the thrill of new love....The pyrotechnic, flashy passages of incredible difficulty and speed shone under his expertly controlled virtuosity." Ray Chen performed the Brahms’ Violin Concerto with the San Francisco Symphony. San Francisco Chronicle: "This was a performance that hit all the required marks — fierce athleticism in the opening movement, broad-beamed lyricism in the central adagio — without quite putting an individual stamp on the material." Mark Peskanov performed in recital with pianist Nina Kogan in Dallas. Theater Jones: "Peskanov was astounding as he easily knocked out some of the most difficult feats of violin playing in the repertoire. It was a wonder to behold."